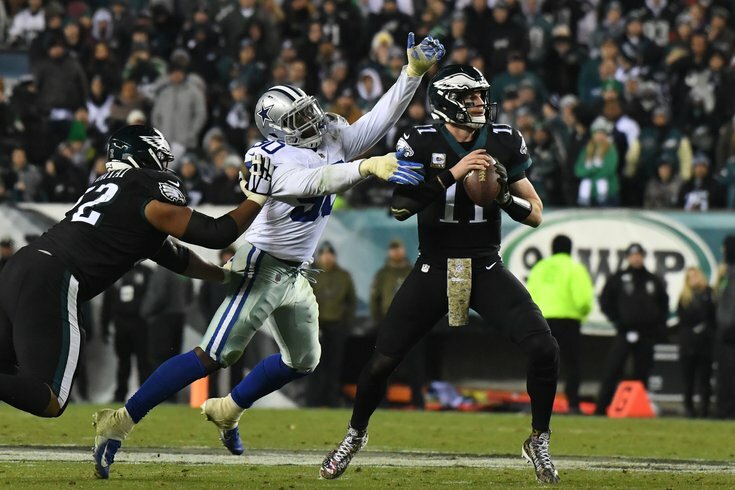 Demarcus Lawrence didn't have any sacks Week 10 vs. the Eagles, but he was around Carson Wentz all night. The Philadelphia Eagles will head to Dallas to face the Cowboys this Sunday in what is the most important game of the season so far, for both teams, as the winner will be in control of the NFC East. And so, because of the stakes involved, we'll take a look at five crucial matchups on both sides of the ball. On Wednesday, we took a look at when the Cowboys have the ball. Today we'll look at the Eagles' offense vs. the Cowboys' defense. In the Eagles' Week 10 game against the Cowboys, they were without Lane Johnson, and were forced to start Halapoulivaati Vaitai in his place. While the stat sheet will show that Lawrence "only" had five tackles, 1 TFL, and 1 hit on the QB, make no mistake -- he had a huge effect on the game. All night long, Lawrence either received added attention, the Eagles schemed plays seemingly designed to keep Lawrence at bay, or when they did ask Big V to single-block him, Lawrence dominated. Lawrence won't have Vaitai to pick on Sunday afternoon. Johnson is back, and is playing better than he has all season long. When Johnson is single-blocking Lawrence, it won't be as easy for Lawrence to create pressure, and because Johnson is once again playing at a high level, it is unlikely that Doug Pederson and the gang will allocate anywhere near as many offensive resources as they did Week 10 to try to take Lawrence away. "Demarcus Lawrence is one of the best in the league," Johnson said. "His hand usage just keeps improving. I think he's one of the best I've seen on film. Him and Von Miller, when you talk about guys that are versatile, long. He's been improving for the last few years now, and he's going to be a tough one." Johnson's presence in the lineup against a Dallas defensive line with a stud as good as Lawrence should really make a big difference. In Week 10, the Eagles got behind early, and could not establish balance on the offensive side of the ball. They passed 44 times, and rushed 16 times. That is obviously not what the Eagles want their run:pass ratio to be on Sunday. When they ran it, they gained 71 yards on those 16 carries for a 4.4 yards per carry average. Lately, the Eagles' offensive line has begun to look more like the 2017 unit than the one that has underwhelmed during the early part of the season. "Obviously it starts up front," said Doug Pederson. "I think the offensive line is playing at a high level right now, and we kind of ride them. The running game has been consistent. We've gotten consistent play from Josh [Adams], obviously, and Corey [Clement], and then mixing Sproles in there." The Cowboys are fourth in the NFL, with 91.2 rushing yards allowed per game. They have also allowed just 3.7 yards per carry, which is good for second in the NFL. The Eagles have faced six of the top 10 teams in the NFL in yards per carry allowed. They were the Saints (1), Cowboys (2), Vikings (5), Colts (7), Panthers (8), and Jaguars (10).The only team that held them to under 4.3 yards per carry was the Panthers. In other words, the Eagles can run it against good run defenses. 3) Golden Tate vs. "Integration"
Is Golden Tate integrated into the Eagles' offense yet? Last week against the Redskins, Tate showed encouraging signs, when he caught 7 passes for 85 yards and a TD, as well as a crucial two-point conversion. Way back in Week 4, when he was still with the Lions, Tate killed the Dallas secondary with yards after the catch. Can the Eagles find ways to get Tate open in space where he can use his run-after-catch ability, and you know, not on those foofy quick screens? The Cowboys had trouble tackling him when Detroit was able to get him open a few months ago. The Eagles' screen game is most effective once the offense has gotten into a rhythm. Pederson has been able to get nice gains on screens after the Eagles have already gotten first downs on drives. Why is that? "If we get a few good runs, and a few play action plays mixed in, we can try to get those guys guessing and not reading as efficiently," Lane Johnson said. Of course, even if Pederson makes a timely screen call, the Eagles' linemen and receivers still have to get bodies on Leighton Vander Esch and Jaylon Smith, who have emerged as one of the best linebacker duos in the NFL this season. Vander Esch and Smith are outstanding at using their speed to run sideline-to-sideline and make plays, like Vander Esch did on a crucial third down play Week 10. Zach Ertz was awesome against the Cowboys Week 10, catching 14 balls on 16 targets for 145 yards and 2 TDs. You can be 100 percent certain the Cowboys are going to be scheming to try to take him away. That's going to open up opportunities elsewhere. Can one of the Eagles' other weapons capitalize? In the last five games, Alshon Jeffery hasn't had more than 48 receiving yards in any one game, nor has he found the end zone. It's time he steps up and makes some "No. 1 receiver" plays.